Emphasizing that owning a firearm comes with both rights and responsibilities, the campaign strives to encourage a national dialogue among the general public, specifically adults with their children, about firearms and firearms safety. Never let your gun get into the wrong hands. It’s not only a tagline in this Safe Firearms Storage campaign, it is also a strong reminder to owners to store their firearms safely by locking them up to avoid unauthorized use and access. 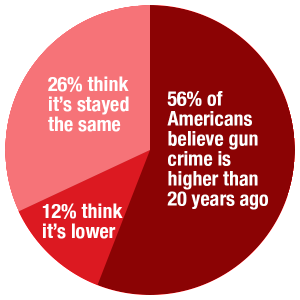 In 2013, the National Crime Prevention Council teamed with the Ad Council and Merkley+Partners to produce a new public education campaign in an effort to engage firearms owners and prospective owners on the importance of safe firearms storage. The campaign ends with a simple call to action to firearms owners to “Lock It Up” when their firearms are not in use. The campaigns that NCPC and the Ad Council have produced over a 30+ year partnership have been powerful — raising public awareness and moving the public to take action. For more than a decade, NCPC and the Ad Council produced public service announcements (PSAs) on preventing gun-related violence and promoting safe storage of firearms to keep our families and communities safe from crime. There is no magic solution that will eradicate mass shootings, teen suicides, or accidental shootings with firearms in the home. But we can do our part to reduce the likelihood of these tragedies occurring. The safe firearms storage campaign encourages owners to simply lock them up — using available technology and equipment such as gun locks and safes. We teach drivers to buckle up in case of accidents and to lock their cars. The same logic applies to this campaign: we want owners to lock up their firearms when not in use to prevent accidents and keep them out of the wrong hands. Throughout our partnership, NCPC and the Ad Council have come together to address emergent issues and help the public understand how they can play a role in preventing harm. This campaign follows that model by stressing the need for responsible storage of firearms in the home and reporting lost or stolen firearms to local law enforcement. Spread the word about Safe Firearms Storage.